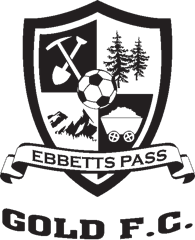 Gold Futbol Club (FC) is Ebbetts Pass YSL's competitive club, providing select travel league and tournament playing opportunities for players age 10 - 18 (U11 - U19). Gold FC's mission is to provide a premier soccer program for players in the Ebbetts Pass community that strive to play at a higher level of play. Gold FC's focus is on player development, both technically and tactically, as well as position specific coaching within a team environment. Gold FC seeks to train players to master various systems of play, to understand and execute both indirect and direct styles of play, to grasp the technical, tactical, mental and physical aspects of the game and learn how to implement combination play and compete in the spirit of hard work, discipline and cooperation. Applications - Teams apply to play in CCSL leagues using the Gotsoccer team application for the Cal North District where you register. How to Apply - Returning teams should apply using their existing GotSoccer team account. You will need your GotSoccer team username and password. New teams can create a new GotSoccer team account at the time of application or contact your Club administrator to create the account for you. CCSL Spring League is offered as developmental season for Boys and Girls, Gold through Copper U8 through U19 CYSA Teams. Play dates - Typically late March 31 through early June. Games may be scheduled on Saturdays or Sundays depending on the club and registration league. Team Rosters - Teams may participate with their fall rosters or with “Paper” or “Secondary” Rosters. A secondary roster can be made up of previously registered players from different CYSA teams and or newly registered players. Check with your League Registrar for more information. Secondary Rosters cannot be used for CYSA tournaments. League Details - CCSL schedules between 8 and 10 games for Spring League. CCSL Spring League will be regional with play in the Valley Region. Brackets are formed to balance geography and competitive levels. Lower level teams (Copper and Bronze) tend to be geographically clustered (close together). Higher level teams tend to travel to find more competitive level of play. Spring is a developmental period. The goal is to allow teams to try new players, new formations, and new opponents. There are no awards and the results are not used in fall seeding. Cal North and CCSL are pleased to announce a new program, CCSL East Bay Summer League! CCSL East Bay Summer League is offered at the request of several Cal North Clubs in the East Bay region and is designed to give teams an opportunity to play games each week during this important training and development period. Teams can use CCSL Summer League as a more affordable option to so many summer tournaments and can use the league as a qualifier for 2014/15 Cal North Cup play. To provide maximum flexibility with an emphasis on player development, Summer League will use the same liberal roster and guest player policies as CCSL Spring League. East Bay Summer League will be based primarily within District 3 and 4. Teams from surrounding districts in relatively close proximity may apply; acceptance will be based on travel distances. Team Rosters - Cal North registered teams may participate with their Current Seasonal Year rosters (same as last fall) or with "Paper" or "Secondary" Rosters. A secondary roster can be made up of previously registered players from different Cal North teams and or newly registered players. Secondary Rosters cannot be used for Cal North tournaments. Please check with your league registrar for more information on secondary rosters. Teams will also be allowed guest players for spring league games. Guest players must be registered with the same Cal North District as the participating team. Open League - 2015 CCSL East Bay Summer League is an Open League. Teams from Cal North affiliated Clubs can play using any US Soccer member registration. Teams may not mix US Club and Cal North passes. The Bill Meyer Winter League are District 8 Paper Teams for boys and girls in the U10 through U14 age group that allow players to participate in a higher level of soccer than played in the fall recreational season. Leagues can use it as a building block for their competitive teams (although established boys and girls competitive teams are not permitted to play). 1) Were currently registered players for the fall recreational season. 2) Soccer aged players 8-9 for U10 (younger players may not play up). 3) Have not played on a CYSA Comp team during the previous season. 4) No new player registration is allowed for this league. The season runs from approximately mid January - early March each year with a blind draw End of Season Tournament held at the end of each season. At least one bye weekend is typically scheduled for rain make-up games. Teams play 2 games per Saturday for approximately 5 weeks. Games are played throughout District 8. Each league with teams entered should be able to provide a reasonable amount of fields accordingly to the number of teams you enter and be available for 3-4 games a day per field. Fields must have rest rooms. The host team provides and pays for referees. Teams not providing fields/referees may have to defray costs of the providing team.